Along with the enhanced counterbalance come those features that made the original Video 18 so popular, including 7 levels of drag, a self-illuminating bubble level, a Touch and Go plate for speedy mounting and removal, and Sachtler's already proven Speed balance technology. The Video 20 S1 not only embraces the Video 20's reputation in the field of news gathering, it aims to surpass it. Like its predecessor, the Video 20 S1 can also easily handle heavier ENG and EFP camcorders, with a Boost Button now included for sudden shifts in payload range (for example, when switching out a shoulder-mount camera for a handheld HDV camcorder or DSLR). Comes with two-stage or speed-lock heavy-duty carbon fiber legs, off-ground spreader, rubber feet and padded carry bag. 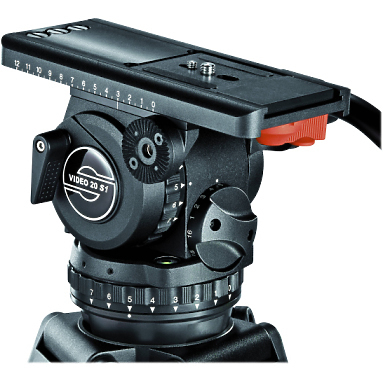 Hire the Sachtler Video 20P Head from Procam. Best service and rental rates for the Sachtler Video 20P Head and all cameras, lenses, sound, lighting and grip.